Yesterday afternoon, around 4pm, the lights went out in our house. Someone hit a telephone pole down the road, and all of the electricity in the surrounding area went out. For a while, it was no big deal. I was painting at the time, and I could continue to paint because there was sunlight streaming through the window. Actually, I didn't even notice the electricity had gone out because I didn't have any running in the room I was in. But then I went downstairs and tried to turn a fan on, and it wouldn't work. And then I tried to get some water for my daughter, and it dribbled out of the faucet. And then I tried to clean up a mess that my other daughter made with nail polish, and I remembered there wasn't any water. And then I tried to start some laundry, and the washer machine just gave me a blank stare. And then we went to the store and got some groceries and put the ice cream in the deep freezer, hoping it wouldn't be too much longer before we had electricity... or I'd have to eat the whole tub of ice cream RIGHT AWAY to make sure it didn't get wasted (right?!). And then darkness began to settle in, and soon we found ourselves just sitting on the couch in the dark. Because we couldn't paint in the dark. And we couldn't work on the crown moulding in the dark. And we couldn't check our email and blogs and instagrams without electricity. And we couldn't catch up on laundry and dishes in the dark, with no electricity. Or use the circular saw. Or take showers. We were providentially forced to rest. Be still. And sometimes, that is exactly what we need. We need the lights to go out so that we can enjoy the rest. But not just the physical rest. The soul rest. Nine months ago, my lights went out. God allowed for a lot of things that I really cared about to be taken from me so that I would be forced to rest. Rest in him. Cling to him. Need him. Last night, it would have been a lot more difficult to find my way through our house if I didn't have the flashlight on my iPhone. And that's what God was during my time of darkness. He was my light that I needed. Dark always illuminates the light. Darkness shows us the glory of the light. The beauty of the light. The importance of the light. The necessity of the light. The wonder of the light. We become thankful for the light like never before. And when we really see the light for what it is... when we see God in all his glory for who He is... we will never be the same. We will crave more and more of the light. We will never take it for granted again. John 8:12 "Jesus spoke to the people once more and said 'I am the light of the world. If you follow me, you won't have to walk in darkness, because you will have the light that leads to life.'" When we're used to the light, darkness is never enjoyable. Especially continued darkness. Especially when we have a lot we want to get done. And this is true of our spiritual lives as well. When it got dark, I just wanted to push ahead. Keep control of my life. Keep doing things. But trying to run ahead and do things in darkness will never work. 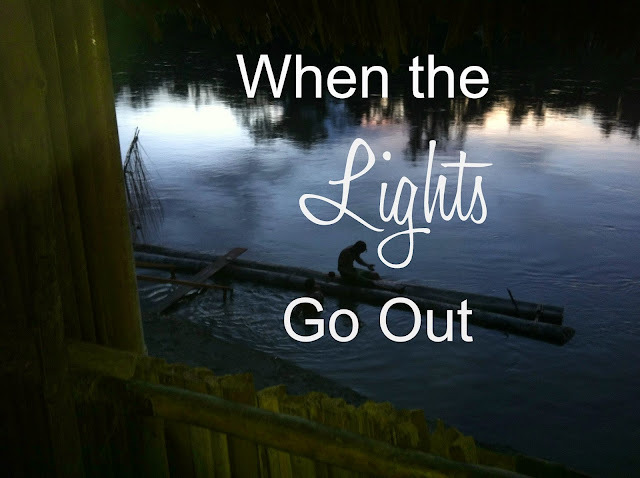 When it's dark, we just need to rest and cling to God. Oswald Chambers wrote, "When you find yourself in a spiritual fog, do not run ahead, but slow the pace of your life. And if necessary, keep your life's ship anchored or tied to the dock." So I anchored in tight. I spent hours reading in my Bible and devotional books. I downloaded worship songs to my phone and played them over and over. I prayed like never before. I listened to sermons and wrote down lots and lots of verses. I gave up Facebook, and I stopped blogging for a season. And do you know what? In the rest, God's glorious light slowly began to fill the darkness. And it filled and filled and continues to fill because his light does not fade. His light source is an endless supply that delights to fill every space and nook and cranny that will allow it. So I continue to pray and look for the nooks and crannies where darkness resides in me and ask that he will fill them with light because I have seen the light and the light is beautiful and I want more of it.